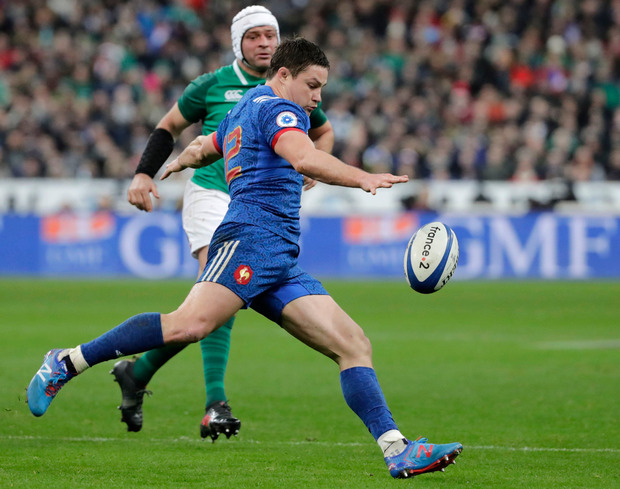 For four seconds, Ireland's season hung in the balance as the eyes of the Stade de France crowd, the millions tuning in from home and the 31 participants on the field fixed firmly on the ball as it made its way from Johnny Sexton's boot towards the goal. Initially, the kick looked good but the flight of the ball began to falter as it neared its target and in the end it slipped over. Sexton was the saviour, but the rescue mission was a team effort. Through 41 phases, Ireland held possession under severe pressure and in difficult conditions - eking their way into range the hard way, inch by inch. Anthony Belleau missed a penalty chance to make it a four-point game and when Sexton stood over his drop-out, there were two minutes remaining. The game would continue deep into injury time, but France would never touch the ball again. Iain Henderson claimed the restart brilliantly, beginning a series of play that will live forever in Irish rugby lore. There were moments within the moment; Sexton's cross-kick to Keith Earls when he felt the need to accelerate the process of getting into the French half was superbly executed - the Moyross man's catch over Virimi Vakatawa was brilliant - and it did the trick. From there, Ireland struggled to go forward but crucially held on to the ball. 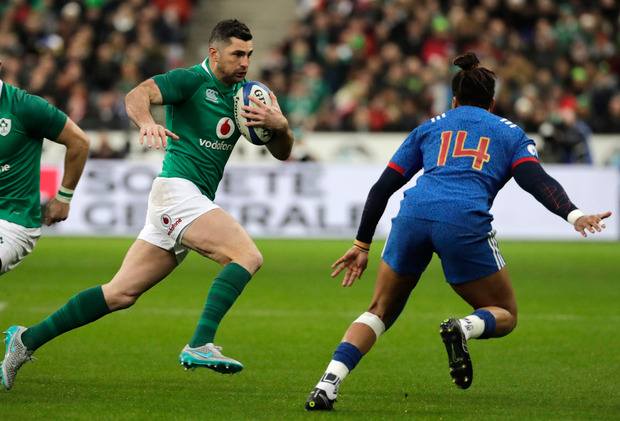 Henderson made one crucial last surge, CJ Stander carried hard and then it was over to Conor Murray to deliver the ball to Sexton (pictured) who was waiting 45 metres out. "It is those moments that are so skinny that you can win or lose by such narrow margins and to win by that narrow margin - I am not really talking about the score, I am talking about the moments," Joe Schmidt explained. "It had ticked over the 80 minutes and the game was all but dead and buried and so I felt it was unbelievably accurate, hard working and skilful to achieve what they did. "To work from a 22 drop-out where you are about 16 metres out from your own line, for Iain Henderson to take that and for us to build the phases from there, to have the audacity to have a cross-kick involved and for Keith Earls to make no contest of it - he was going to claim that no matter what - that showed clarity of thought and then some of the appeals to the referee when guys were lying in the way, made it look to me that it was going to be impossible. "My thoughts were that we could not score with seven, eight, nine second rucks. We could not score a try but that did not stop Johnny knocking over a drop goal." 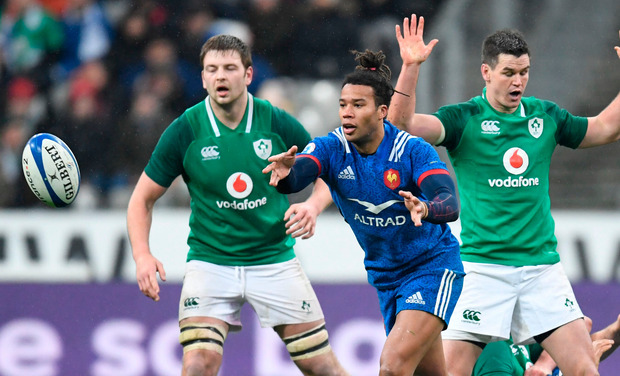 Schmidt was correct to question some of Nigel Owens' calls during the pulsating 41-phase end-game, but the Welsh official could easily have given a penalty or scrum France's way too. Instead, he swallowed his whistle. Owens would have come in for some criticism had Ireland not managed an escape, he made a number of questionable decisions at big moments. And yet Ireland would have first had to look at themselves, they had somehow let a nine-point lead slip during an aimless second-half display. Sexton missed a kick from his blind spot that would probably have put just enough distance between the sides, while their inaccuracy cost them in the 22 at times. Their breakdown work was poor, they were unable to dominate physically and yet what went before is almost rendered irrelevant by the character, courage and skill displayed in injury time. They had built their lead by punishing French ill-discipline. Despite the difficult conditions that made it difficult under foot and in possession, they displayed plenty of attacking ambition and when they stayed in their structure looked a team to be reckoned with. But they couldn't quite get the kind of lead they needed to put France away and the home side hung in there through the boot of Maxime Machenaud and, in scenes eerily redolent of the 2016 encounter at the same venue, they managed a late surge to take the lead as the final whistle approached. 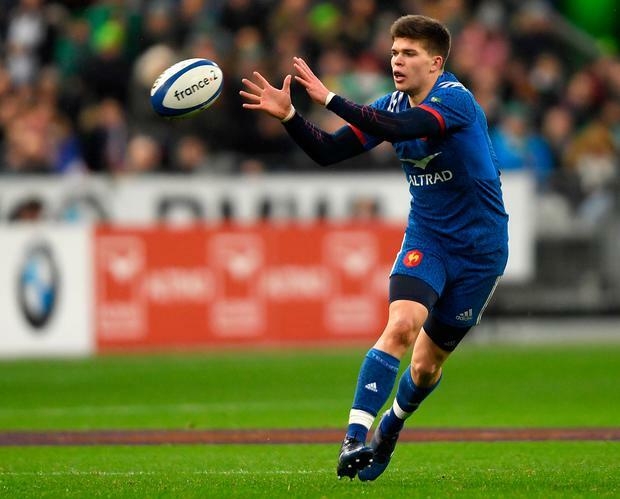 They did it in some style too, with Antoine Dupont and Teddy Thomas combining for a memorable score that had the Stade de France on its feet, with Belleau giving his side the lead for the first time with the conversion. He couldn't extend that advantage when given the penalty and Sexton made him regret it in sensational style. FRANCE - G Palis; T Thomas, R Lamerat, H Chavancyh, V Vakatawa; M Jalibert (A Belleau 30), M Machenaud (A Dupont 67); J Poirot (D Priso 55), G Guirado (capt) (A Pellissie ), R Slimani (C Gomes Sa 55); A Iturria (P Gabrillagues 61), S Vahaamahina; W Lauret (M Tauleigne 68), Y Camara, K Gourdon. IRELAND - R Kearney; K Earls, R Henshaw, B Aki, J Stockdale (F McFadden 75); J Sexton, C Murray; C Healy (J McGrath 61), R Best (capt) (S Cronin 68), T Furlong (John Ryan 70); I Henderson, James Ryan (D Toner 68); P O'Mahony, J van der Fliern (D Leavy 36), CJ Stander.